OuiShare is on a mission to build and nurture a collaborative society. A forward-thinking, action-oriented community of thousands from around the world, the organization has been decentralized from the beginning. Formed in Paris in 2012, OuiShare is built around the notion of letting community members take initiative and enabling the community grow on its own. In OuiShare, a leader can pop up anywhere on any project. The organization embraces dynamic hierarchies where hierarchical relationships exist, but these leadership roles are dependent on a project, situation, or time, not fixed. OuiShare Fest 2016 will host 200 sessions in seven different spaces. Within the organization, OuiShare experiments with different ways of organizing, thinking, and collaborating. A key element is a willingness of community members, and the organization at-large, to experiment with new ways of being—to put into practice theories about how we might collaboratively create a healthy, just communities. 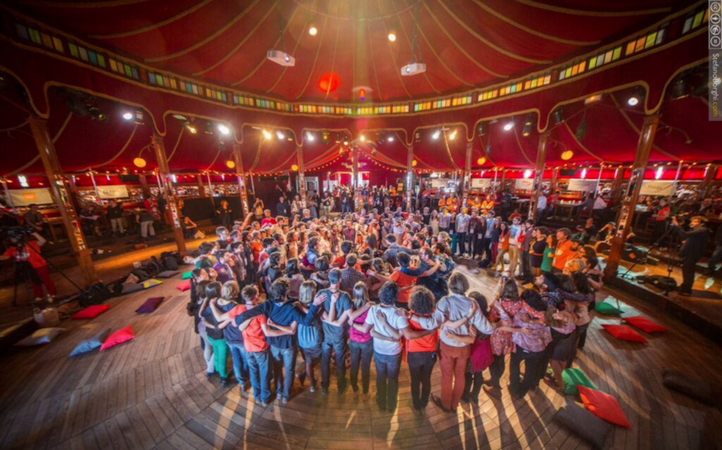 For the past three years, OuiShare has hosted OuiShare Fest at Cabaret Sauvage in Paris. The four-day event is a gathering of international thought-leaders, change-makers and doers, brought together to share ideas, challenges, experiences, projects and more. The idea is to learn from presenters and other participants, and think critically about trends and emerging ideas in the global culture of solutions activists. At last year’s event one of the hot topics was blockchain. Conversations about the technology and how it could be used in arenas and platforms other than financial, flourished. In particular, how it could help create collaborative autonomous organizations that aren’t controlled by any one person. Blockchain is most known today for its applications in the world of finance. But its proliferation has also sparked the development of a growing ecosystem of infrastructures and tools that build on top of the blockchain or decentralized protocols, for example Uber-like ridesharing app La’Zooz, digital art attribution platform Ascribe.io as well as Swarm and Backfeed, both tools for distributed, collaborative organization. To experiment with ways the technology could help address numerous challenges related to decision-making, transparency, governance and value distribution, OuiShare put blockchain technology into practice. UsingBackfeed, a “social operating system for blockchain-based applications,” they decentralized part of OuiShare Fest by using the tool to help create the festival program. Using Backfeed, they hoped to improve the sourcing of the best content from the community and make it easier for the members to contribute to the project and get recognized for the value they provide. True to its reputation for experimentation and critical thinking, the OuiShare team launched the experiment with an open mind. The result of the Backfeed experiment, says Pick, is that they had some interesting results very fast, but they hit a wall in terms of how far they can go with it. The experiment brought to light the need for a reliable tool designed to meet their own needs, and they learned that decentralizing a project is easier said than done. Now we can only look back fondly at those early times of abounding, and possibly naive, excitement and hope for these new models. For now, it appears only few are benefitting from the abundance of value that has been created by communities and entrepreneurs worldwide – few organizations that are starting to look suspiciously similar to those they were disrupting – or worse? The gold rush was not profitable for many who set out on the initial journey. And the biggest sacks of gold are going to those providing the picks, shovels and infrastructure, those fueling the gold rush itself. Now on the other side of the sharing economy gold rush, OuiShare is calling for action and to mobilize and build from where we are now. The extreme examples, created by mega-platforms including Airbnb and Uber, helped identify questions that need to be asked and problems that need to be addressed. The theme of this year’s OuiShare Fest is After the Gold Rush. The 2016 OuiShare Fest comprises 200 sessions in seven spaces, dozens of speakers from around the world, including Shareable’s Organizing Director Tom Llewellyn who will lead a workshop about Sharing Cities, and 15 satellite events. One of the key topics to be discussed at After the Gold Rush is the future of work. The fest promises to play host to countless conversations about ownership models, the new workforce, the freelance economy, worker cooperatives and platform coops, organizational transformation, new forms of governance, purpose-driven businesses and organizations, and blockchain. New at Ouishare Fest this year is Fest Forward, a three-day accelerator for collaborative, open source projects with high social impact. Growing out of innovation community POC21 and the OuiShare Awards, Fest Forward is replacing competition with an opportunity to collaborate and be action-oriented. The goal is to help projects overcome challenges in areas such as product design, business models or scalability by giving them a customized program and pairing them with mentors. As OuiShare continues to grow and evolve, and OuiShare Fest thrives as an international gathering of new economy changemakers, the organization is always looking for new ways to empower individuals and communities around the world. Moving forward Pick is working on open sourcing OuiShare Fest by creating a tool to document how they organize, create and run the festival, so other teams can do the same thing. The goal is to empower others and encourage the growth and evolution of OuiShare Fests and related events in cities around the world. With a new tagline: Exploring the Edges, OuiShare Fest hopes to catalyze new ways of thinking and acting in regards to the economy, society and ourselves.